PreSonus NSB 16.8 is designed to work seamlessly with PreSonus StudioLive Series III mixers, and is capable of offering 16 locking combo mic/line inputs with remote-controlled XMAX preamps that include gain compensation for shared input scenarios, as well as 16 direct inputs via AVB. All inputs can be controlled from a StudioLive Series III console and from free PreSonus UC Surface software. All eight outputs employ locking XLR jacks, while the built-in 2-port AVB switch lets you daisy-chain multiple units. The rugged steel chassis with sturdy handles is designed with a stage box form factor and allows the NSB 16.8 to sit well on the stage and survive the rigors of on-the-road wear and tear. The unit can be rackmounted with an optional rack-ear kit. Analog Input/Output Locking, remote controllable combo mic/line inputs 16 remote-controllable XMAX preamps Gain compensation for shared inputs 8 locking XLR line outputs. Meters, Controls, and Processing Mute All button +48V indicators Easy setup and control from StudioLive® Series III consoles and UC Surface. Digital 32x8 AVB (16 direct input channels + 16 gain-compensated input channels) 2 AVB ports with locking XLR Ethernet jacks. Actively Integrated Software Easy setup and control from PreSonus UC Surface touch control software for Mac, Windows, iPad, and Android, available free from Apple App Store and Google Play. Power Locking IEC power jack. Physical Rugged stage box enclosure Optional rack ears Compatible with stage pockets from Ace Backstage. Microphone Preamplifier Input Type: XLR Female, balanced Frequency Response to Main Output (at unity gain): 20-20 kHz, ±0.5 dBu Input Impedance: 1 k THD to Main Output: <0.005%, +4 dBu, 20-20 kHz, unity gain, unwtd S/N Ratio to Main Output (Ref = +4 dB, 20 kHz BW, unity gain, A-wtd): 94 dB Common Mode Rejection Ratio (1 kHz at unity gain): 65 dB Gain Control Range (±1 dB): 0 dB to +60 dB Maximum Input Level (unity gain): +12 dBu Phantom Power (±2 VDC): 48 VDC, switchable per channel. Line Inputs Type: ¼ TRS Female, balanced Frequency Response to Main Output (at unity gain): 20-20 kHz, ±0.5 dBu Input Impedance: 10 k THD to Main Output: <0.005%, +4 dBu, 20-20 kHz, unity gain, unwtd S/N Ratio to Main Output (Ref = +4 dB, 20 kHz BW, unity gain, A-wtd): 94 dB Maximum Input Level: +18 dBu. XLR Outputs Type: XLR Male, balanced Maximum Output Level: +24 dBu, ±0.5 dBu Output Impedance: 100. Digital Audio ADC Dynamic Range: 115 dB (A-wtd, 48 kHz) DAC Dynamic Range: 115 dB (A-wtd, 48 kHz) AVB Audio Network Ports: Locking XLR Ethernet Sampling Rate: 48 kHz. Power Connector: Locking IEC Input-Voltage Range: 90 to 230 VAC (±10%). " (178 mm) Width: 16.7"? (424 mm) Depth: 4.5? (114 mm) Weight: 6.2 lbs. That's why we go to great lengths to provide accurate, full-detail descriptions in every item. How do I return an item? We will promptly issue you a Return Authorization (RA) number. Oversized items digital pianos, etc. Product must be in resalable condition. 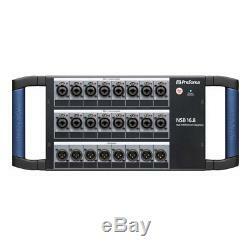 The item "PreSonus NSB 16.8 16x8 AVB-Networked Stage Box with16 XMAX Preamps, 2AVB Ports New" is in sale since Tuesday, August 7, 2018. This item is in the category "Musical Instruments & Gear\Pro Audio Equipment\Live & Studio Mixers". The seller is "gigasonic-outlet" and is located in San Jose, California. This item can be shipped worldwide.